We in Social Tech is an innovative accelerator programme, set-up to support ambitious women-led social technology businesses. The accelerator is delivered by Nwes, the largest not-for-private-profit enterprise agency in the UK, in collaboration with founding partner Deutsche Bank, through its social enterprise programme Made for Good. To offer three six-month support programmes over two-years, including business growth plans, investment and finance readiness, peer learning groups and free co-working space. To provide an estimated 720-hours of both tech-industry and Deutsche Bank employee mentoring. To create a thriving professional network of tech experts, and provide pathways to develop business relationships. With 40-years of experience working with entrepreneurs across multiple sectors, Nwes helps to start-up 2,000 businesses each year and support more than 5,000 business owners through advice, skills master-classes, access to finance and workspace. Nwes has won multiple awards for its work in encouraging enterprise, providing total business support and capacity building to start-ups, for business growth and employment. 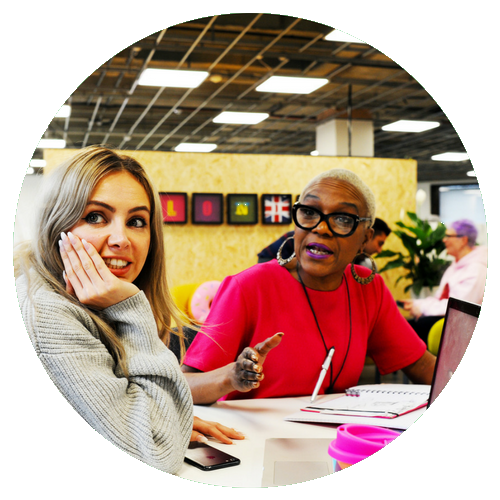 The Nwes social ethos includes addressing the under representation of female founders in the tech sector, as well as the unique challenges women face when growing a business, and they aim to assisting the growth of future role models. Nwes believes that technological advances can be harnessed by businesses to make a positive social impact in communities through creating employment, increased productivity and through the services and products they provide. Deutsche Bank has a long history of championing initiatives that drive positive change in society. The global social enterprise programme Made for Good supports the success of all kinds of entrepreneurial ventures that create wider social good, including microenterprises, start-ups, non-profits and commercial businesses. Deutsche Bank sees itself as a technology-driven company, making investments into digital technology across all businesses with an ambition to be a leader in the area of digitalisation. As a natural extension of its core technology business, Deutsche Bank’s support of We in Social Tech will utilise employee’s skills and experience through an estimated 360-hours of mentoring for participants. Haringey is home to over 267,000 passionate and proud residents. Haringey Council are ambitious for Haringey’s future and have great ambitions for the people who live here. We believe that everyone deserves the opportunity to realise their potential and build a future through rewarding work. Careers in STEM are the future and Haringey Council are delighted to support the We in Social Tech programme taking place at Wood Green Works. Why We in Social Tech? Women entrepreneurs (We) in the technology sector face greater challenges and obstacles to success than men. Research shows that women are sorely underrepresented with less than 7% of tech jobs in Europe filled by women. There is a lack of role models, gross pay inequality, as well as challenges in raising finance. In wider entrepreneurship terms, women are still in the minority despite having the potential to make a huge impact. Through providing structured and bespoke support to female-led businesses we can work together to remove these barriers. Technology and innovative business models have the potential to solve some of the world’s most pressing environmental and societal problems. However, Social Tech, also known as Tech for Good, holds some unique challenges for entrepreneurs. They struggle to build sustainable business models that delivers user, social and financial value at scale, and it can be a challenge for social enterprises to position themselves as viable investment opportunities to investors.